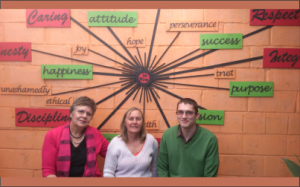 Staff members at the Matric Academy of Excellence, from the left, Mart van Vuuren, Patricia van Niekerk and Matthew Duncombe. After more than 40 years in education Mart and Toy van Vuuren sensed God was giving them a vision to uplift disadvantaged students. Mart, a former Teacher Training College lecturer and Toy, a former High School Principal, spent three busy years preparing to launch a Grade 8 to 12 Maths and Science school of excellence in Port Elizabeth. Thereafter Mart got up at 3am every morning to pray and God gave them ideas. One morning in 2010 Toy woke up early and amazed her by dictating a complete plan of action for the school that came out of the book of Proverbs. Mart says she obeyed God and drove where He directed and found the Sakhisizwe Senior Secondary school. The acting principal was standing in front of the building. She asked him if they had any vacant classrooms and he said they had 16 empty rooms. To Toy’s horror the classrooms were in a shocking state of dilapidation without doors, windows or celilings and filled with rubble. But Mart says she immediately felt excited and they subsequently began a big cleanup and renovation project that would eventually cost them approximately R350 000. The result is that they have facilities where the students are close to the school. The Matric Academy of Excellence officially opened in January 2011 with a vision to offer Grade 12 students quality education and personal development aimed at realising their God given potential and purpose. We cater for students who want to improve their matric results in order to pursue tertiary education, or to rewrite subjects they failed, or to write or complete matric on the old (pre 2007) syllabus. All endeavours at the Academy are built around seven core, Bible-based principles: honesty, integrity, love and caring, discipline, diligence, mutual respect and humility. The values are echoed on signs above classroom doors and on a passage walls. The Academy’s results have been amazing. Not only are the students achiveing their academic and career goals but during their time at the school all of them get to know Jesus Christ as their Saviour and Lord and as a result many of them are experiencing radical transformation in their own lives and in their relationships with family and friends. Mart has also introduced a culture of outreach at the school and as a first project students are serving people at a nearby old age home. On their first visit a women of 98 was led to Jesus. Mart says she considers the daily individualised development sessions with the students to be even more important than the academic programme. She believes (based on Psalm 139) that all of her students are born leaders and that the school’s job is to raise leaders. “My forte is to help parents and children to come together: mothers and daughters to reconcile; to bring fathers together with sons who hate them because they abandoned them 20 years ago,” says Mart. While I was chatting with Mart and some of her teachers, several students passed by. Asked by Mart how they were they all replied brightly: “On top of the world!” They acknowledged that their lives and attitudes have changed radically during their time at the school. One said she had stopped lying and stealing from her mother. Mart says she is blessed with teachers who “have such a heart for God” and whom she can trust completely. She also says they have the most well disciplined, teachable students they could wish for. The Van Vuuren’s sponsor a number of the students who come from shack environments and cannot pay fees. Currently they have the most dedicated students. When they started the school their idea was to keep to small groups in order to ensure individualised attention. But now they believe it is time to help 100 to 200 additional students. “We can actually accommodate more students. I would love to sponsor more students but we cannot afford to sponsor more than we do because I would love to pay my staff a higher salary and pay them a bonus at the end of the year. When I prayed about it the other day, the idea came to me that if 100 Christian people would each sponsor one student we could help so many more students, assist them with food parcels and open a soup kitchen to feed students who come to school hungry because they leave home early or don’t have food at home,” says Mart. Mart is full of ideas for the school. She plans to start a chess project. And she wants to start a computer centre for the benefit of the students and the local community. One of the challenges is that they don’t have electricity for computers, but they have ways of overcoming obstacles. Men of God hanging out in PE taverns! Proud of my parents! They are doing a great job! We need many more Angels like them in our country! Amazing Wonderful God! Special people who obey Him. Well done, keep bldg. people for a God fearing & God honouring SA.